Death is hard on a family. Funeral arrangements, bills, custody, and distribution of property are decisions that need to be made upon the death of a loved one. The best gift you can give them is the peace of mind knowing they do not have to make all the decisions without your input. If you have underage children a will allows you to make an informed choice of who should care for them. Dying without a will means you die intestate and laws of intestacy will determine the fate of your children and property. It's important not to leave it up to the state to decide who raises your children. Have you divorced and want to make sure your ex does not inherit any of your property? Do you have someone in the family you do NOT want to inherit? Want to make sure a certain relative receives the family Bible, wedding china, or handmade quilts? Have a family business you would like to pass along to family? A vast majority of businesses do not survive past the first generation due to a lack of estate planning. The easiest way to avoid any of these problems is to have a will prepared. Without a will part of your estate could end up in the hands of someone you do not want to enrich. Regardless of whether or not you have a will, your estate will have to go through the probate process. A will helps speed the process along and can also help minimize estate taxes. In a will an Executor is appointed so you know your estate will be handled by a trustworthy person. The Executor will then work with an attorney to make sure your wishes are carried out so the state does not make those decisions for you. Did you have a will prepared 20 years ago? Life changes happen all the time. New marriages, children, divorce, and death may be a reason to change your will. 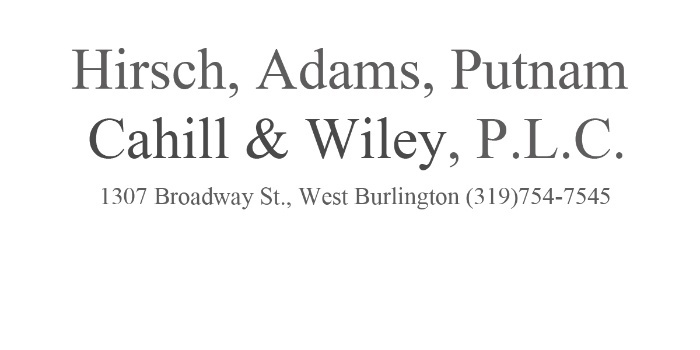 At Hirsch Law Office it's easy to make changes for a nominal fee. Call 319-754-7545 to prepare your Last Will and Testament. Disclaimer: Information in this blog post should not be construed as legal advice but is for informational purposes only. This is not a substitute for legal counsel on any subject. Seek appropriate legal or professional advice in your jurisdiction on the facts and circumstances at issue before acting or refraining to act.